Once upon a time, the appeal of Kingdom Hearts was all about seeing Disney and Final Fantasy collide. With Kingdom Hearts 3, it's pretty much just the latter, with only a few sly references to the Final Fantasies we grew up playing. In the Toy Story world, there's even a shop display of familiar summons, though they're billed as being from Dissidia Final Fantasy NT. Kingdom Hearts 3 feels the most at odds with the series' Disney-stuffed history somehow. In the universe of Kingdom Hearts, worlds exist in solitude with their own characters, stories, styles, and more. Throughout Kingdom Hearts, worlds have almost always been in the shape of Disney movies. In the first Kingdom Hearts we swam alongside Ariel from The Little Mermaid; in Kingdom Hearts 2, we became animal extras in The Lion King. In Birth By Sleep, we went to Neverland. Kingdom Hearts 3 shifts its sights away from pretty much all Disney things pre-2000. Instead, we get to listen to Elsa sing the entirety of "Let It Go" in Frozen (whether the sequence is intentionally or not intentionally hilarious, it is truly hilarious); we get to ride a toy rocket down Andy's street in a team attack in Toy Story's Toy Box world, like in the first movie. It's mostly still joyous—a big plus being that the worlds are far bigger and more detailed than ever before—but it did leave me missing the more classic Disney callouts of past games. Some of my favorite Disney worlds across Kingdom Hearts history have been Halloweentown (both times), the old-fashioned styled Timeless River, and the Fantasia-set world of Symphony of Sorcery. Monstro, despite being one of the most boring worlds design-wise, has the best music. I had a fantastic time with Kingdom Hearts 3, and largely I credit that to its story beats and stronger combat design. I did however, similar to what Mike Minotti of GamesBeat wrote late last week, find that its smaller amount of worlds affected its overall pacing. With a slimmer overall scope of locales, the adventure felt a bit resigned, and less like the grandiose odyssey that the other two numbered entries do. It's the world of the 2010 movie Tangled, an animated film that is almost 10 years old!? How in the hell... Nevermind. Anyways, early on in Kingdom Hearts 3, you direct your Gummi Ship toward a planet with the universe's tallest tower. 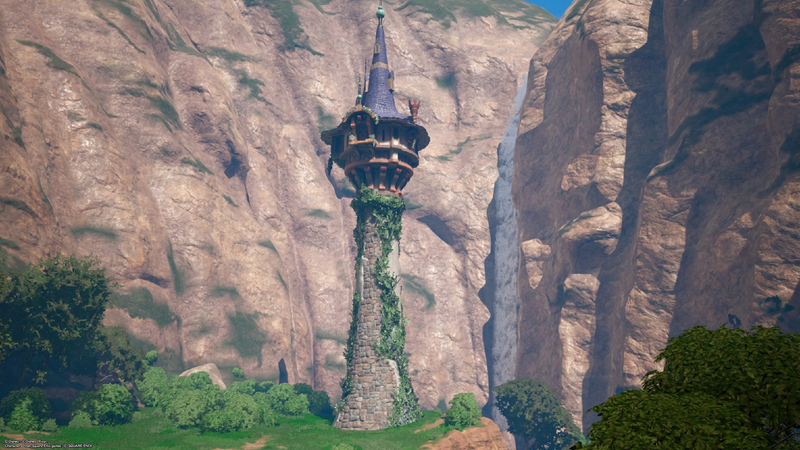 In the world of the Kingdom of Corona, the tower doesn't actually look that tall, but it is hidden away in a mountainside alcove. Kingdom of Corona is beautiful. The grass is lush, contrary to the enclosed spaces of Toy Story's Toy Box and Olympus' perpetual beige and concrete-looking clouds, the worlds directly before it. (Another early game world, the original locale Twilight Town, is lovely though, as it's always been.) When you get to frolic in Corona's forested outskirts for the first time, like how Rapunzel does once she leaves her tower, it's magical. 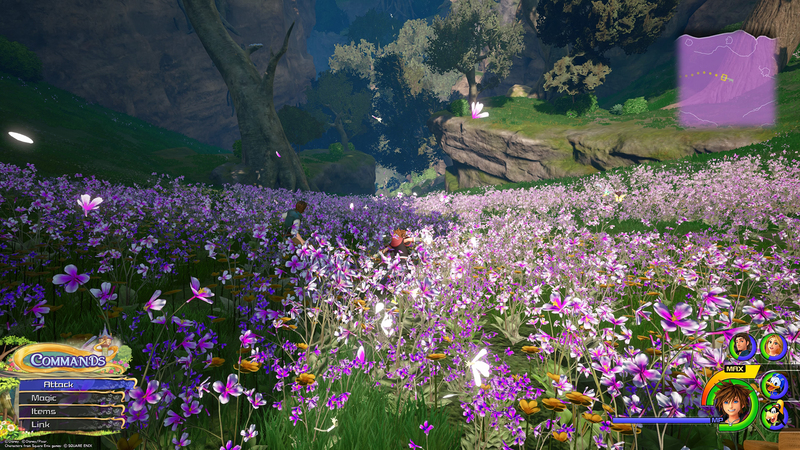 Many other games have perfected the wonder of nature in this sense, but running around the Heartless-spawning environment of Corona makes you feel like you're actually in a Disney movie. Part of that is because of how endearing Rapunzel and Flynn are as sidekicks. During the story for Kingdom of Corona, they are both at your side, fighting in battle. Rapunzel, who usually carries her ridiculously long hair, throws it as a lasso around tree branches, and you can see her swinging around in battle in the corner of your eye as you're dealing with some other pesky enemy. Her team attack is equally amazing: she throws her hair around Sora, Donald, and Goofy, and with the help of Flynn swings them around like a wrecking ball. It's outrageous. Between battles, if you stay still long enough they roam around the bright green fields on their own. I found myself taking a lot of pictures in the Tangled-themed world with my Gummi Phone. There's even a sequence where Rapunzel excitedly runs into a shallow lake, and splashes Sora. Running around, Sora eventually catches up and splashes back. It's the little moments like this that make Corona really special, coupled with the spectacular animation that looks just as the movie did. It's one of the most rewarding to explore too. In the beginning of exploring the forest of Corona, the spaces are wide open, reminiscent of the Kingdom Hearts we've always played. Eventually, the party happens upon an eerie swamp, where the enemies are more plentiful, the collectable ingredients are sprouting from just about every tree trunk, and the lighting is impressive as it shines through the darkness. It's a more twisty area, with secret crevices tucked away—taking our expectations for this sunny world, and flipping it upside down. Luckily there's an exit eventually that leads to a calming reprieve from what was once uncomfortable. Here, the forest starts to clear away and boulders emerge, opening up for more vertical exploration before reaching the best part of Corona: its adorable town. Throughout Kingdom Hearts' history, there has been a distinct lack of NPCs. It's possible to point to that being the PS2's fault, but when you look at other JRPGs of the era, it wasn't like the inclusion of NPCs was impossible. Just, for some probable technical reason, most worlds would seclude its NPCs in makeshift safe areas, or in buildings. Never would you see NPCs disperse at the sight of some Heartless and return to their normal business after you obliterated them. NPCs simply just weren't around. Kingdom Hearts 3, luckily, changes that. Some environments, like Kingdom of Corona, even have charming additions like butterflies or birds around, making the primary battle-your-way-through sections more charming. In the city of Corona, there are no Heartless to be found; just flocks of townspeople going about their daily lives. Along the main street, NPCs are huddled around food stalls (which you can smack with your keyblade for ingredients). Sora can do a handstand on some barrels, earning extra munny thanks to street performing a silly show-off flourish as people crowd around him. There's even a cute dancing minigame in the town square where Sora twirls and steps with gals and lads from the land. Kingdom of Corona is the most complete feeling world of Kingdom Hearts 3, because it has everything you could ever ask for in a Kingdom Hearts world. The characters look incredible, and offer some much-needed humor. The town's gorgeous to explore, with lots of secrets to hidden away in its equally bright and gloomy forest. It mixes the familiar of the series with the new, and was the first moment of Kingdom Hearts 3 where everything clicked for me: where its combat ran chaotic but manageable, where its HD sensibilities and lack of loading screens felt the most distinct. Kingdom of Corona is Kingdom Hearts 3 at its best, at its most "this is current gen." In my time chasing missing Mickey emblems and hunting barely out-of-reach ingredients to synthesize the powerful Ultima Keyblade, Corona is where I keep finding myself returning to, like I've taken out a timeshare in its charming kingdom. Tagged with Action,	Microsoft,	Opinions,	PlayStation 4,	Role Playing Games,	Rpgs,	Sony,	Square Enix,	Xbox One.